Sometimes I feel like it get too wrapped up in coming up with great new flavors and combinations that I forget the simple joys of canning. I’m definitely guilty of making pear, plum, and ginger jam. I’ve thrown some black pepper in with strawberries. And I’ve made jelly out of things that don’t want to be jelly, like Guinness beer and apple cider. So occasionally I need to step back and remember some of the simple reasons that I can in the first place. Like saving money, eating ingredients that I’m aware of, and spending time in the kitchen making things for my family. This is one of those posts that goes out to the people who say “I’m brand new to canning, what should I do the first time?” I usually point people in the direction of jam, but simply canning fruit can be rewarding and very simple. I’m also going to touch on siphoning and thermal fractures, because both of them happened to me tonight. 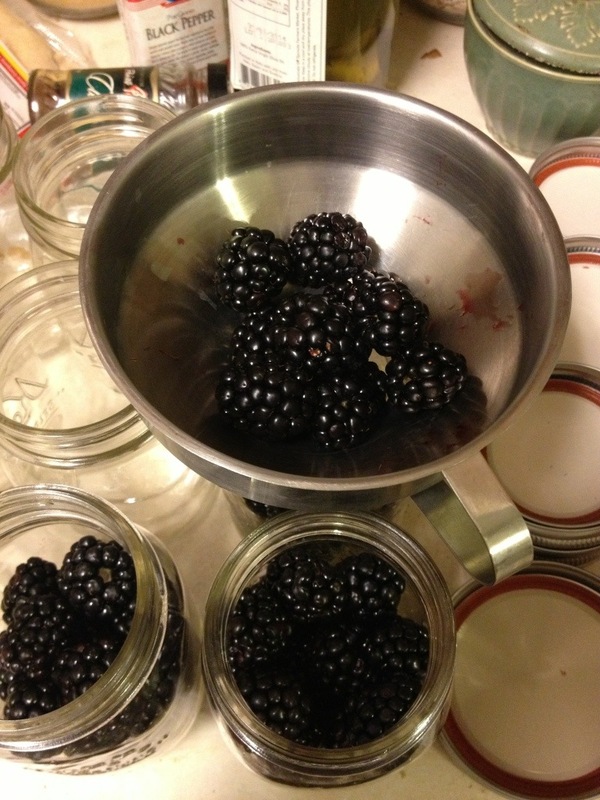 While I was out today I found pints of blackberries for $.25 apiece. I picked up three flats. Bartlett pears were on sale for $.69 a pound and while I haven’t paid to close attention to the price of pears, that did seem well below average. So I grabbed a huge bag of them as well. 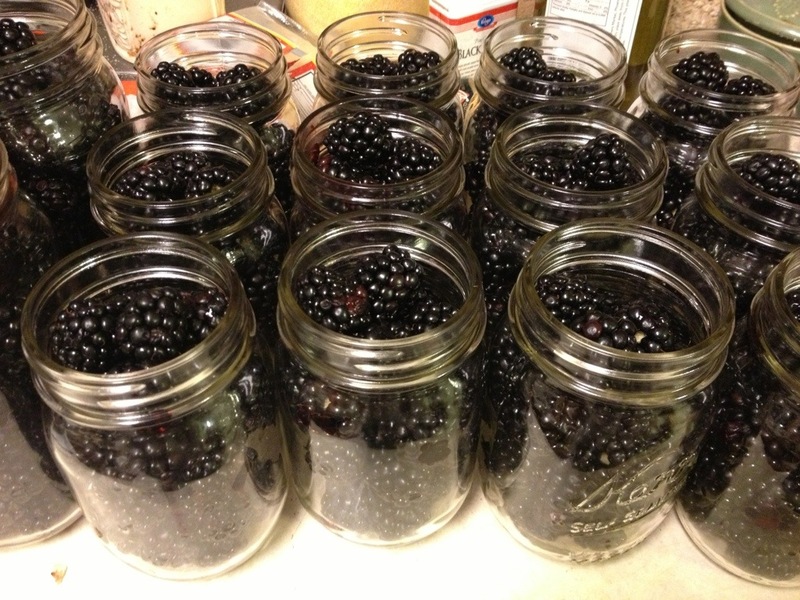 Go through your blackberries, rinse them off, and pick out any that even have the slightest hint of mold. 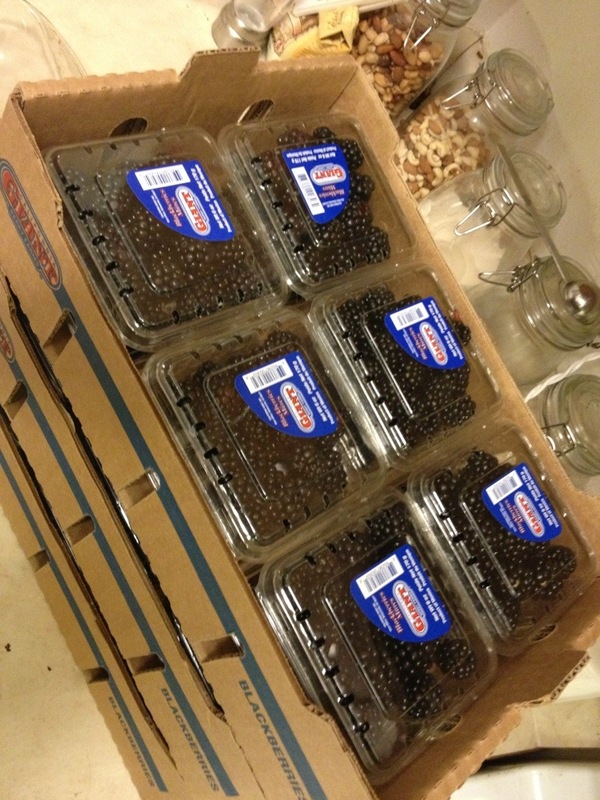 For most berries I use a cold pack method. Hot pack involves heating the food to cook it through before placing it into jars. Cold pack is just like it sounds, you place the raw food directly in the jar. Blackberries stand up to the heat fairly well, but no point in overcooking them since I don’t want them to turn into mush. 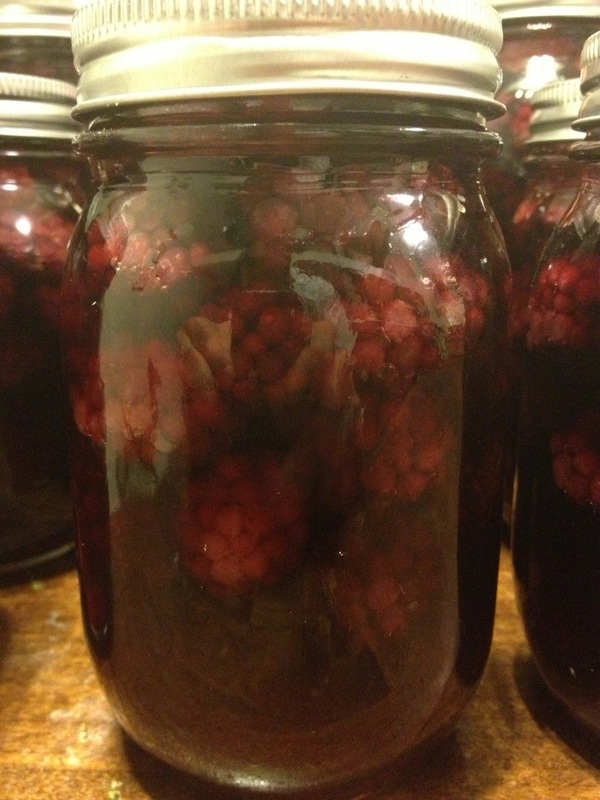 Place the berries in your jar leaving enough headspace. All fruit needs some kind of liquid to sit in. People use plain water (rarely), fruit juice, or syrup. I did not want to add commercial juice to my fruit so I opted to go with syrup as I usually do. You can make several different types of syrup from very light to heavy, all depending on what ratio of water to sugar you use. 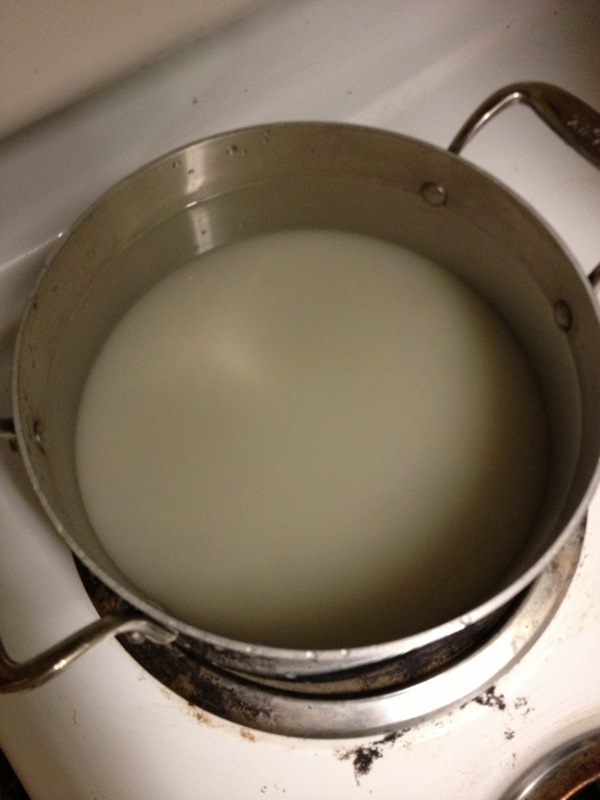 I make a light syrup which is approximately 2 cups of sugar in 7 cups of water. When you first add the sugar to the water it will be very visible in the bottom of the pan. Heat it over medium-high heat and begin to stir. As the water heats up the sugar will disappear. Continue to heat until bubble start to form. However do not bring it to a full roaring boil. Ladle the syrup over your fruit leaving 1 inch of headspace. You can see that the hot liquid is already beginning to leech some of the color out of the berries below the surface. Place a new lid and clean ring on top of your clean jars. I read recently on the county extension website that the USDA is no longer requiring sterilization before every batch. As long as the jars are cleaned and processed for the correct amount of time sterilization prior to filling them is not necessary. I have stopped boiling my jars for anything that I waterbath process. For the pressure cooker items were botulism is still a concern I think I’m paranoid enough that placing the jars in an inch of water and letting them steam for 20 minutes before I fill them gives me a bit of reassurance. 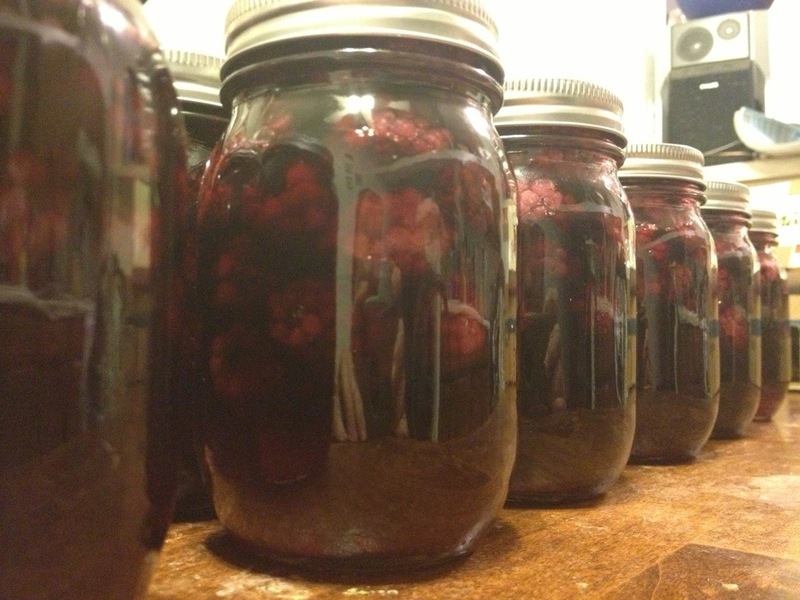 Place the filled jars in your waterbath canner and process for 20 minutes for pints and 25 minutes for quarts. 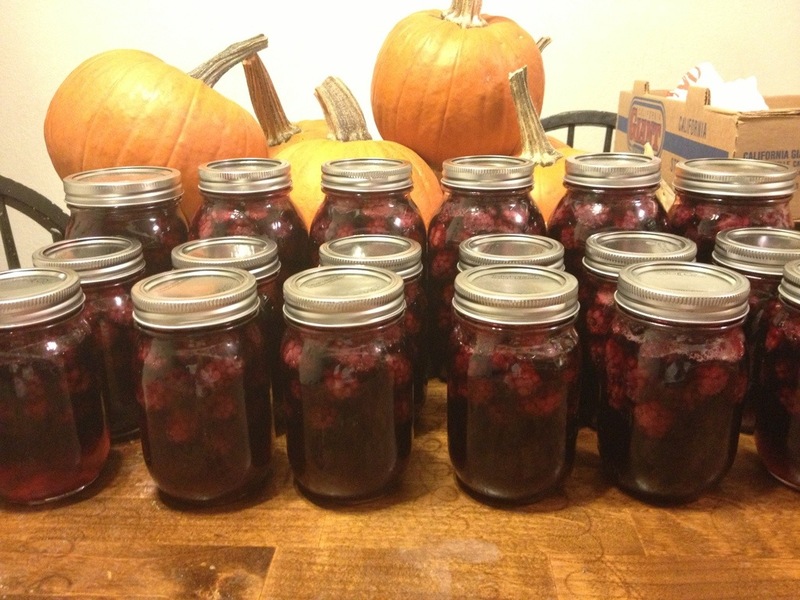 Blackberries hold up fairly well to the canning process. My wife makes herself a fruit smoothie nearly daily. Instead of trying to keep fresh berries on hand all the time she’ll simply open a pint, spoon out what she wants for that day, and then place the rest in the refrigerator. They are also good as ice cream toppings. Additionally, you can take the contents of a quart jar add some flour and sugar and pour it directly into a pie tin to make yourself a fresh blackberry pie. 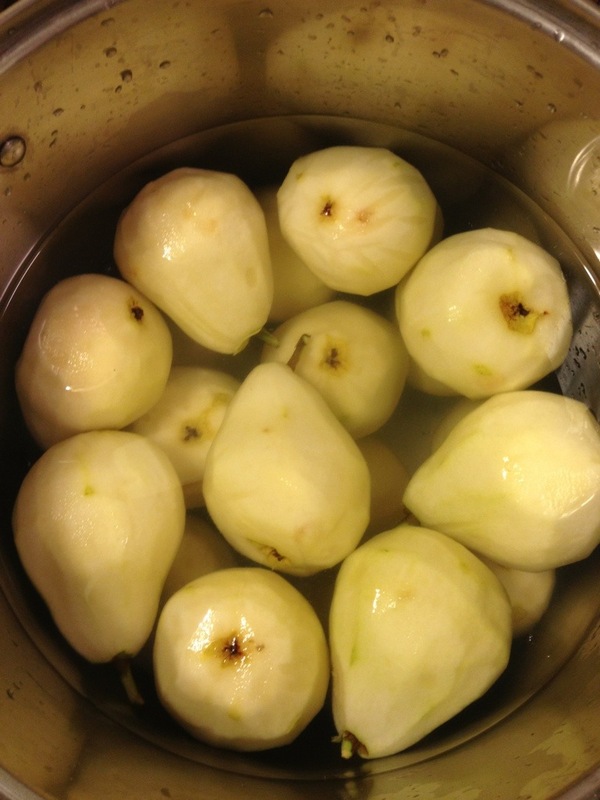 When I made pear butter a couple of months ago I used Bartlet pears. 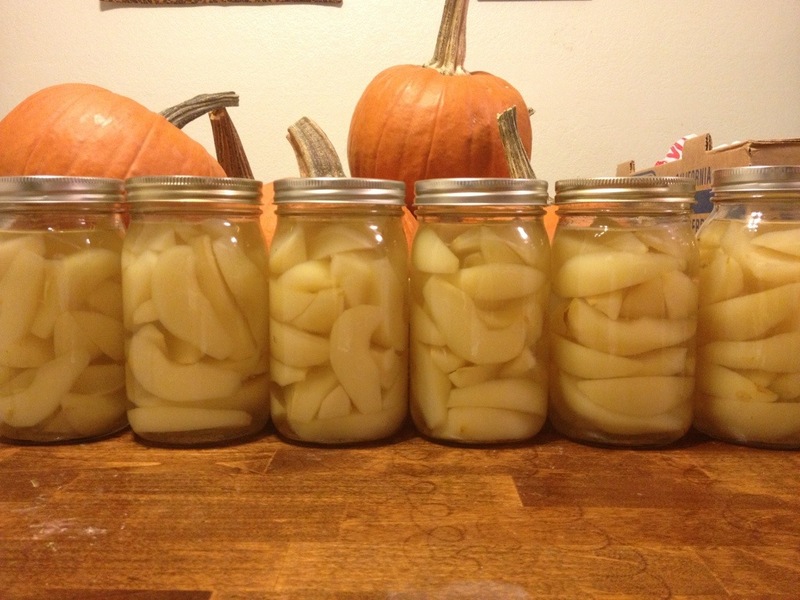 I was so impressed with the flavor of those pears I wanted to preserve some. However I let the box sit around for too long and they became too soft to can on their own. When I found them on sale again I picked up a large bag so that I could save some for later. 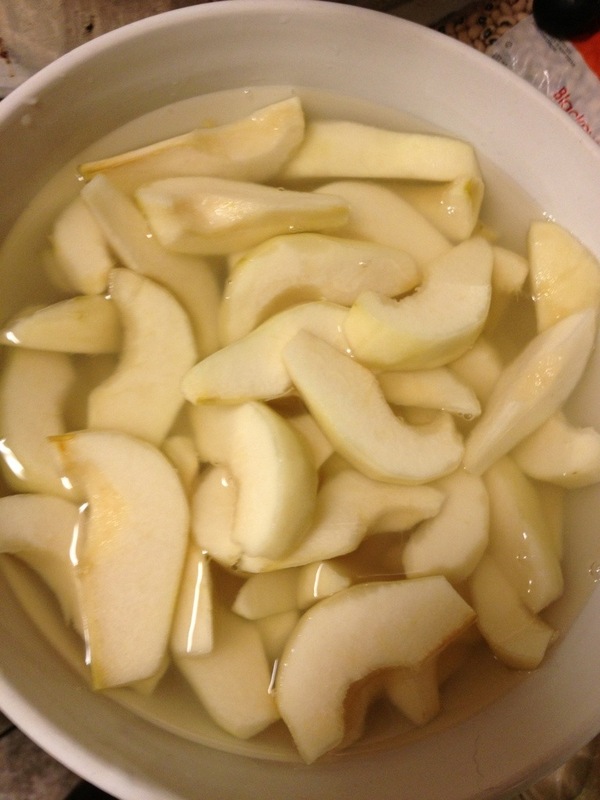 Start by peeling your pears and adding them to a large pot or bowl that contains water and either citric acid or lemon juice. 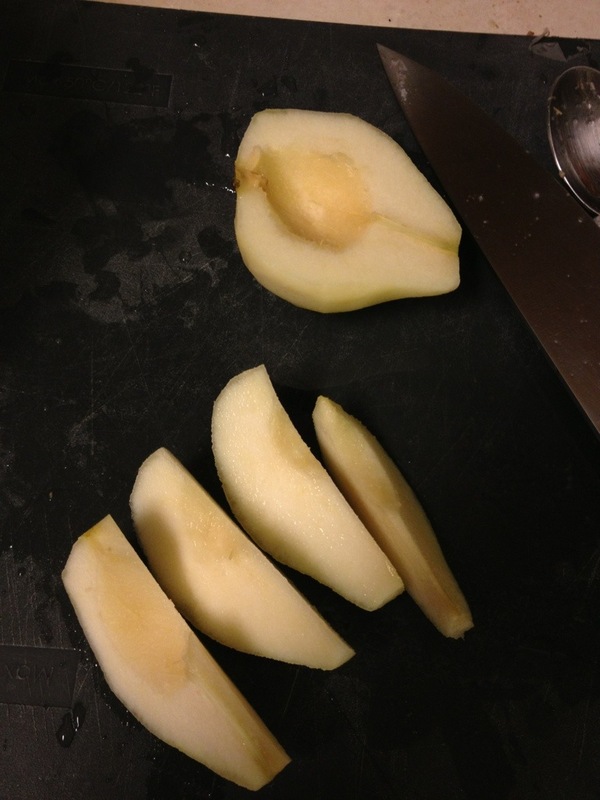 Take each pear, cut the top off to remove the stem, and then slice in half lengthwise. 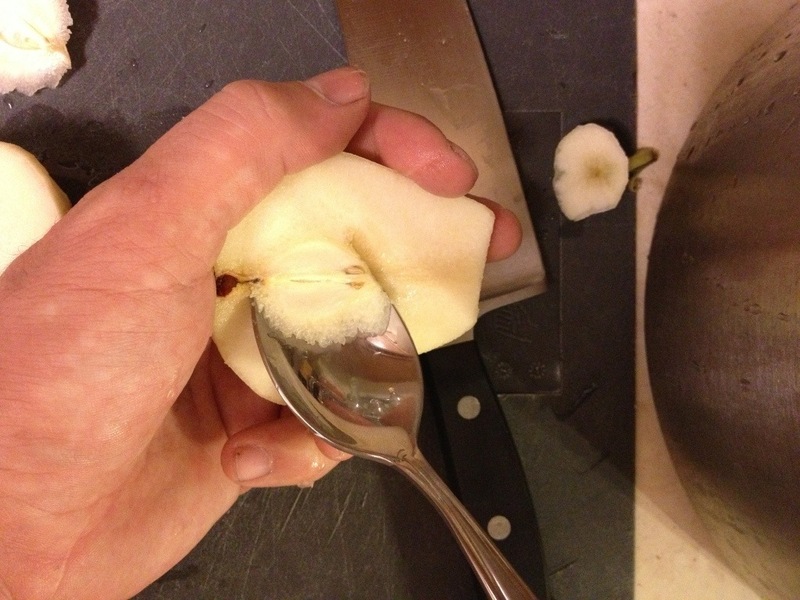 Use either a teaspoon or a melon baller to remove the core. The next step is up to you. 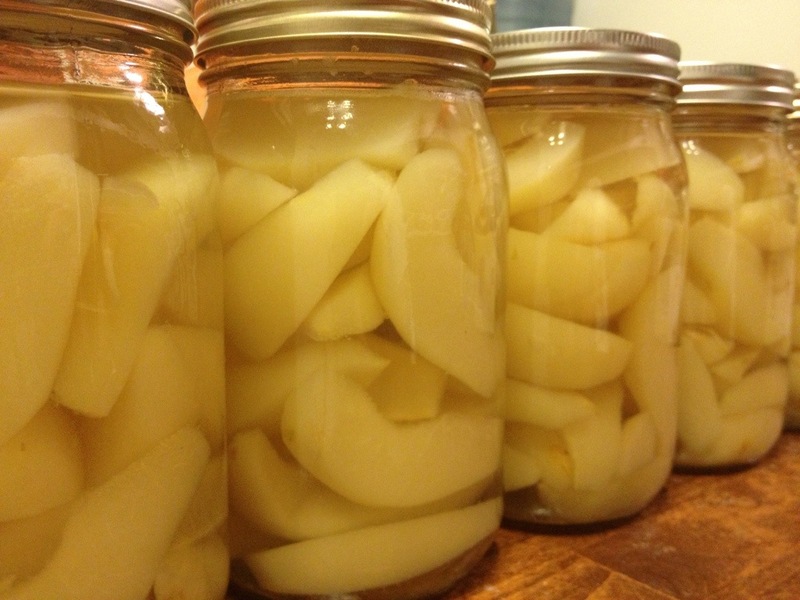 You could can half pears if you had widemouth quart jars handy. I preferred slices to fit more in each jar. I sliced each half into four quarters. As you slice the fruit return it to the same pot or a different one that has acidified water to preserve the color. Again you’ll want to decide what kind of syrup or juice to place your fruit into. I use the same light syrup. 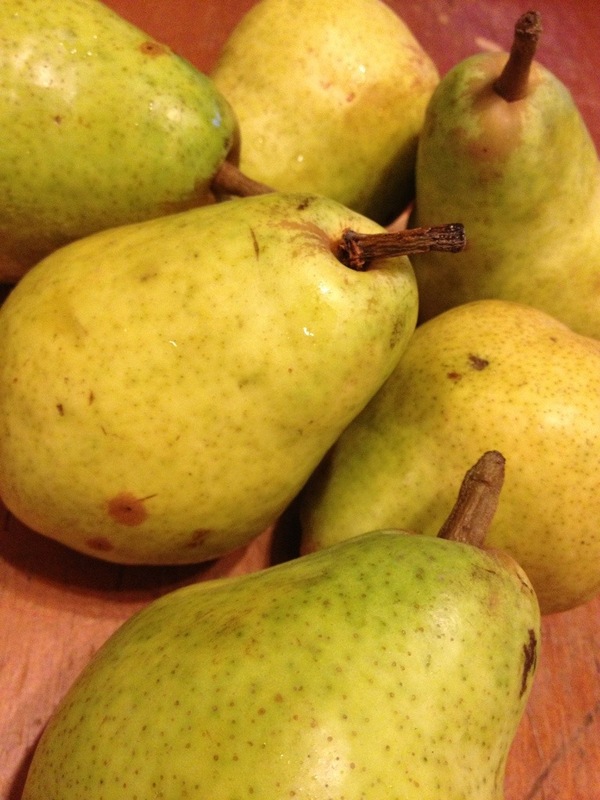 The USDA currently has no recipes that call for cold packing pears. 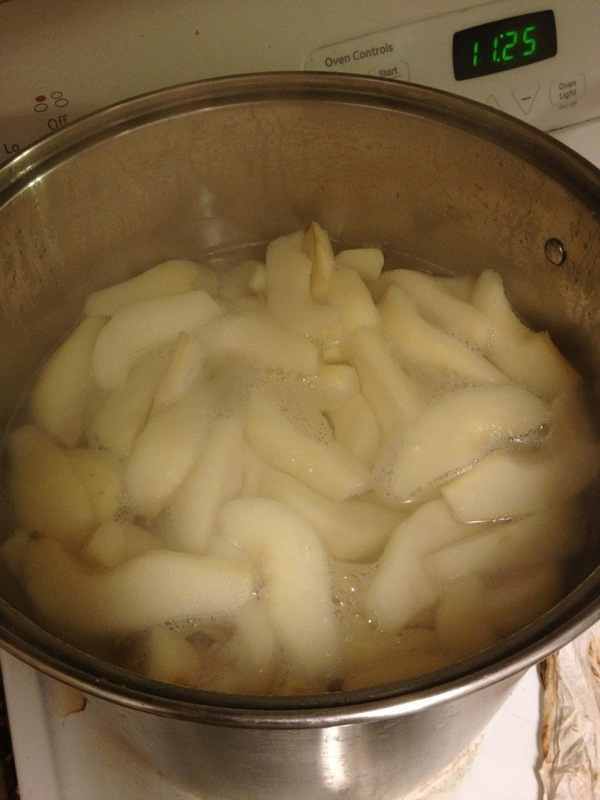 This time we bring the simple syrup up to a boil and then place the fruit in the syrup and boil it for five minutes. Using your funnel and ladle fill the jars with pears and then fill with the syrup liquid that you boiled them in, up to a 1 inch headspace. Put on new lids and clean rings and process in a water bath canner for 20 minutes for pints and 25 minutes for quarts. The pears came out fantastic. I think they held their color really well. The important part here is that I will be enjoying blackberries and pears when everyone else is paying four dollars a pint and $2.99 a pound for them. People can for so many different reasons. Nutrition, tradition, preparedness, necessity, taste, and cost savings. 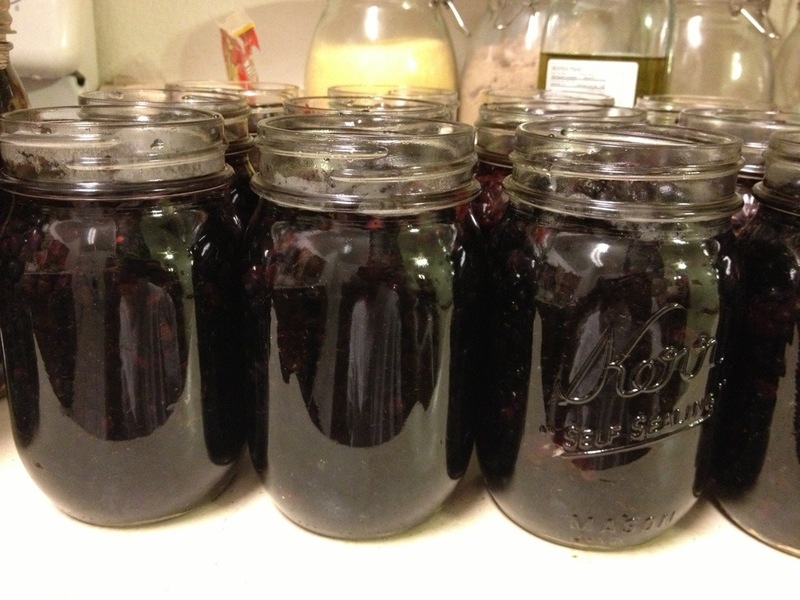 As much as I enjoy making extravagant jams and jellies to give away as gifts I enjoy the simple pleasure obtained from preserving low-cost produce to be enjoyed a later date. A Word On Syphoning and Thermal Fractures. There are several things that can happen to canners to interrupt their enjoyable evening. One of them is siphoning and abother is breakage. What is siphoning? Simply put it’s the contents of the jar leaving the inside and going to the outside very quickly. It is due to a rapid change in temperature or pressure. 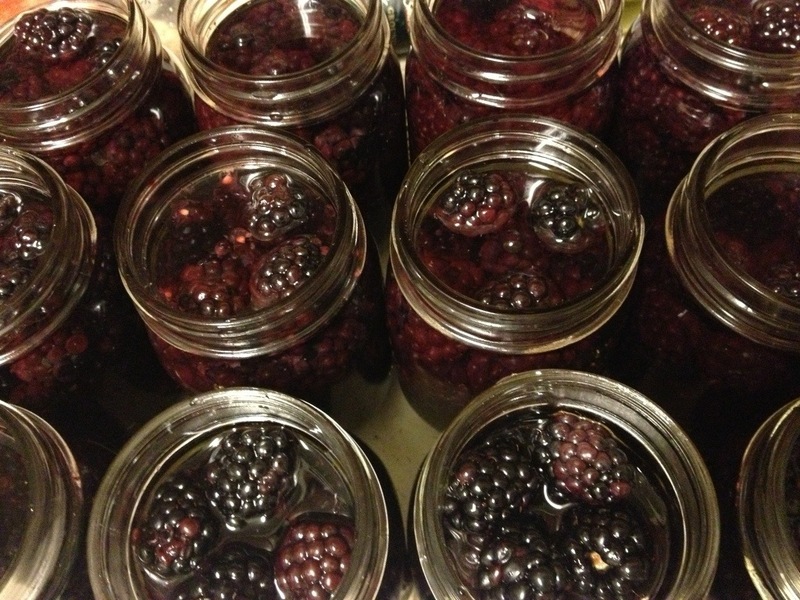 I’m not sure why but I noticed that almost all of my jars of blackberries suffered from siphoning. As the timer went off I would remove them from the water bath and set them on the counter. Almost immediately dark purple and red liquid seeped from under the lid and spilled all over the counter. Siphoning is bad for many reasons. First off I’ve had it occur previously during a pressure canner session when I returned to find 4 quarts filled with vegetables but no liquid. That’s bad folks. That time it was a result of me removing the pressure canner from the stove and trying to cool it rapidly with the use of water. I was very very new back then. But unfortunately the food was wasted anyway. 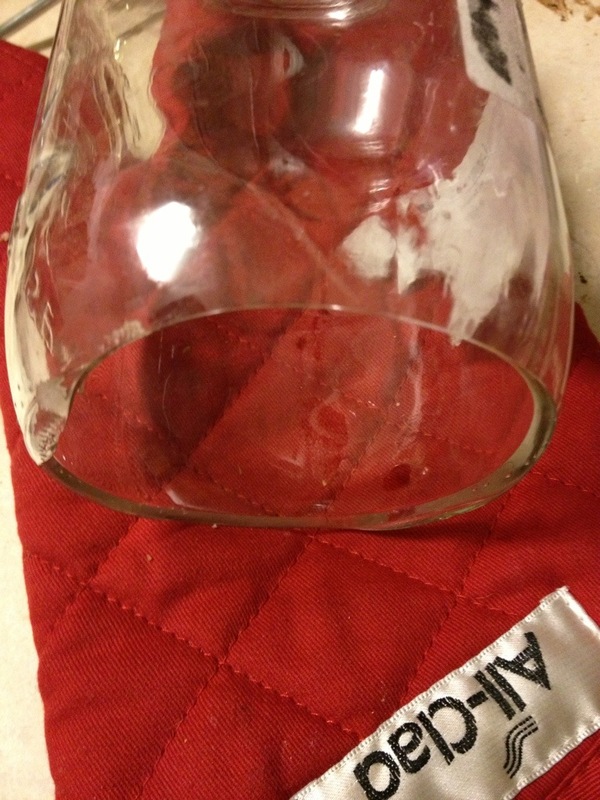 The other problem is that the escaping liquid can prevent a good seal on the lid. You guys all know that you have to listen for the pop and check the seal of the lid on the jar when it’s finished, right? If you do suffer from siphoning, but it is only a small amount of liquid, and your lid sets and seals you do not have to worry. Your biggest concern at that point will be washing off the exterior of the jar to prevent any mold growth on the outside. So, how do you prevent siphoning? If you are using a pressure canner when the time is up simply turn off the burner and walk away. Don’t attempt to move the canner off of the stove to a cool burner or countertop. And definitely do not place it in the sink and run cold water over it the way you can to remove cooked foods quicker. Just let the temperature drop on its own. If you are using a water bath canner when the time is up turn off the burner and wait two to four minutes. 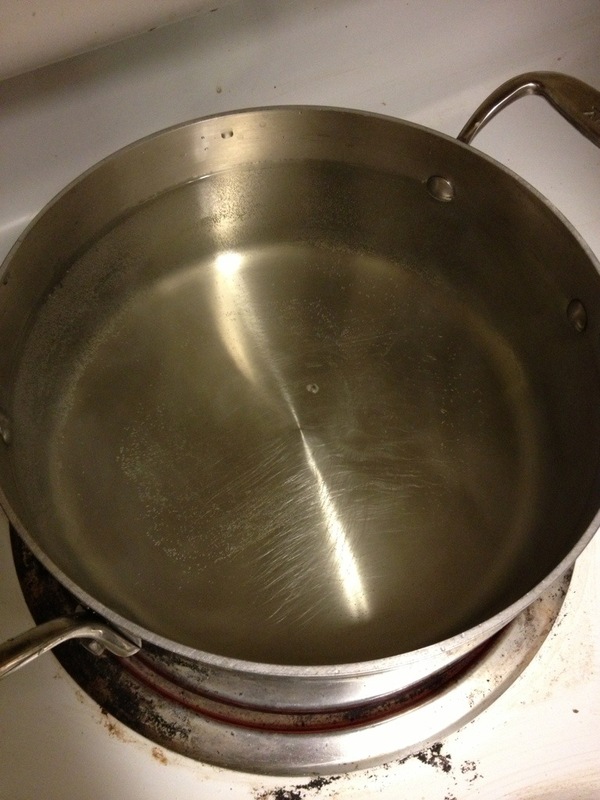 Allow the water to slowly stop boiling and the jars to acclimate to the lower temperature before removing them. Place the jars on a folded up kitchen towel rather than directly on the cold countertop. Allowing slower transitions between temperatures should prevent siphoning. Speaking of rapid temperature changes have you ever seen thermal fractures? Jars break for one of two reasons. Thermal fractures or impact fractures. The first is caused by rapid temperature changes. Usually something too cold getting too hot too quickly. The second is caused by jars knocking into each other, implements knocking into jars, jars falling over, et cetera. Luckily they are easily distinguished and identified. 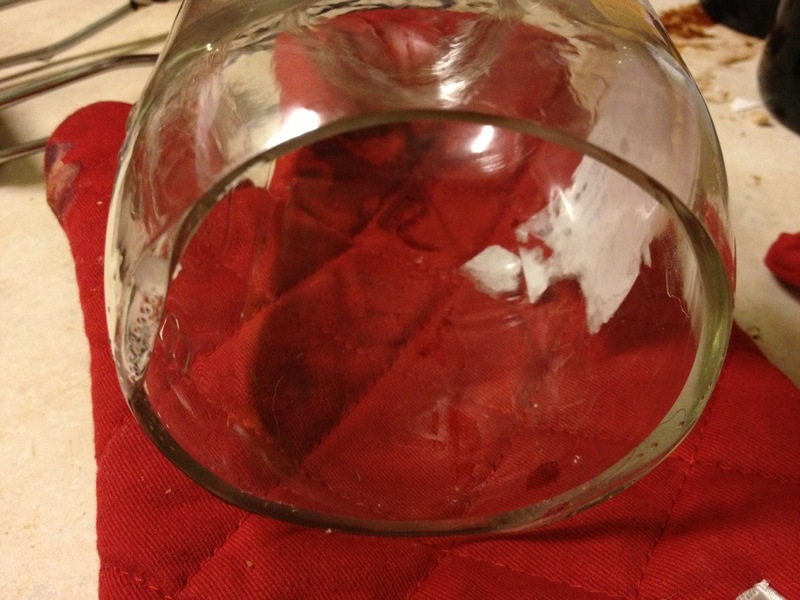 Impact fractures will run vertically up the side of the jar either in a straight line or lightning bolt pattern. Thermal fractures will run horizontally around the jar, and in my experience only at the very base. The fracture is extremely straight and clean almost leaving no sharp edges. 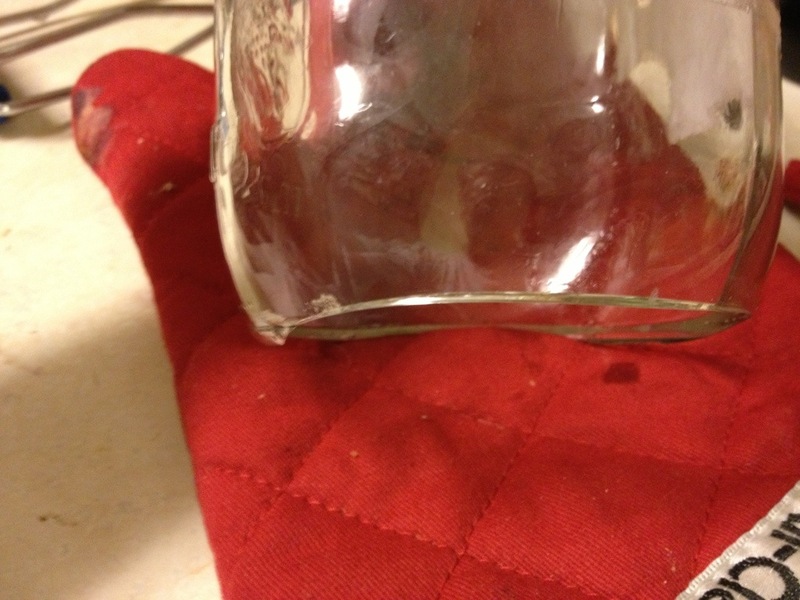 Thermal fractures are caused by your jar heating up to rapidly. You started with cold jars and placed hot food inside of them, or your jars had hot food inside of them and you place them in a pot that was too hot, or you placed the jars directly onto the surface of the bottom of the pot without having any kind of insert to gain elevation. 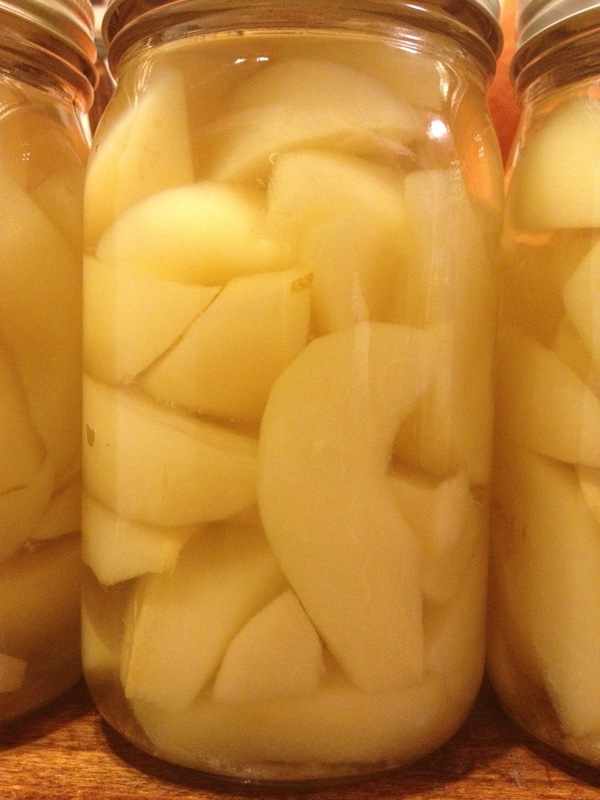 If you are sterilizing your jars before each batch this is generally not an issue. However if you are not, be sure to heat your jars up in the dishwasher or by using hot water before filling them. Always keep your jars off the bottom of the pot. Luckily for me I found this one almost immediately after it happened because I took the lid off of the pot to check on the contents. I was able to salvage the ingredients, find a new jar, and continue on. 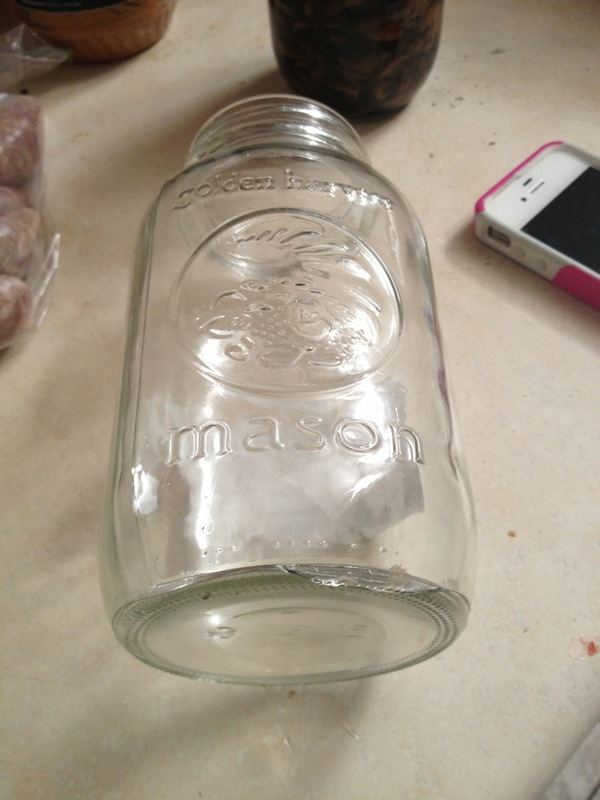 Do notice that this is a Golden Harvest jar and not a Ball or Kerr brand. I believe Golden Harvest was Walmarts house brand there for a while. I’m not sure where this one came from as it was my only one. But I do trade my goods with other people and pick up jars at thrift stores and garage sales as I see them. I recommend sticking to the two major name brands to know that you’re getting quality jars. 1st Time Tiling; Lessons Learned.